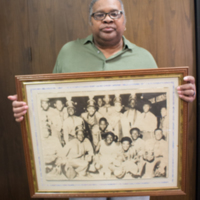 The values, struggles, successes, and character of the Rondo community are vividly expressed through the artifacts featured in the digital history database. The most popular narrative on Rondo is composed of stories of destruction, due to the construction of the I-94 freeway that divided St. Paul’s historic Black community. While this narrative is important, it often overpowers the vibrant cultures, businesses, personalities, and relationships that existed in the area prior to highway construction. The digital history database helps preserve some of these lesser-known narratives, and features objects from soup tureens to trumpets. This exhibit will focus on the various forms of media and education that were present within the Rondo Community, and will explore the subcategories of music, newspaper publications, and both informal and formal education methods. Rondo residents remember their culturally rich neighborhood as a setting for art, literature, and music. While music was often rooted in the gospel sounds of the church, this exhibit explores music in other settings, and illustrates how it allowed people to come together.This exhbit also features newspaper publications, which not only illustrate events happening at the time, but also represent a more informal form of education that was present in the Rondo community. Lastly, in this exhibit, formal and informal education function as a window into the community cohesion of the Old Rondo neighborhood. Indeed, the analysis of this exhibit reveals the ways in which schooling institutions promoted both the transference of knowledge and the management of social bonds for members of Old Rondo. Despite the fact that the following analyses of media and education inhabit physically separate spaces within this exhibit, they are inextricably linked as venues through which residents of Old Rondo were able to build community and develop cultural practices.